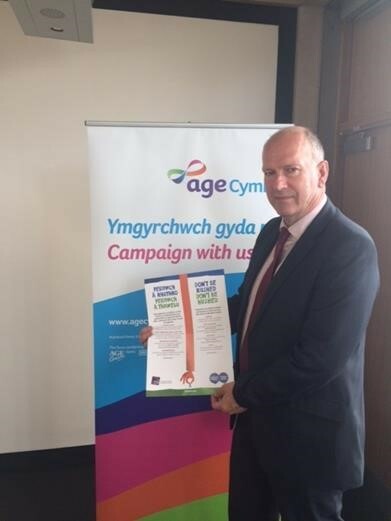 David Rees AM has joined forces with Age Cymru to support Scams Awareness month. The month is aimed at highlighting the types of scams and swindles that are being used by criminals to steal money. Age Cymru say there are four basic types – online, telephone post and doorstep. Sadly many elderly people in particular fall victim to these scams. Research has revealed that more than 2,500 scams were reported to trading standards departments in Wales between February 2012 and February 2013. However the figure could be the tip of the iceberg as the Office of Fair Trading believes only 5% of scams are reported, meaning that 50,000 scams could have been committed. Never buy anything instantly on the doorstep, even if you are pressured. Never give strangers your financial details, eg bank account, credit card etc Police and banks will never ask for financial details by e-mail or on the phone. If they do it’s a scam. Never fall for direct marketing letters that claim you have won a fortune. Don’t be conned by hard luck letters or e-mails from abroad. Never hand over credit cards, bank details or cash to ‘couriers’. Use only reputable local traders for work on the house or garden. Avoid investment ‘opportunities’ from cold callers, especially by phone.